When I booked a trip to Boston to see my friend, Daena, We thought it would be nice to run a half marathon together. After some researching, we came across the NYCRUNS Narrows Half Marathon. Since my flight landed in Boston, Daena picked me up from the airport and we headed straight for NYC. We stopped by Target for some forgotten essentials and Cliff Shot BLOKS. And of course no East Coast trip is complete without Dunkin Donuts. After getting settled we headed straight to Brooklyn for packet pickup. Our hair went up really fast with the NYC humidity and traveling via subway. 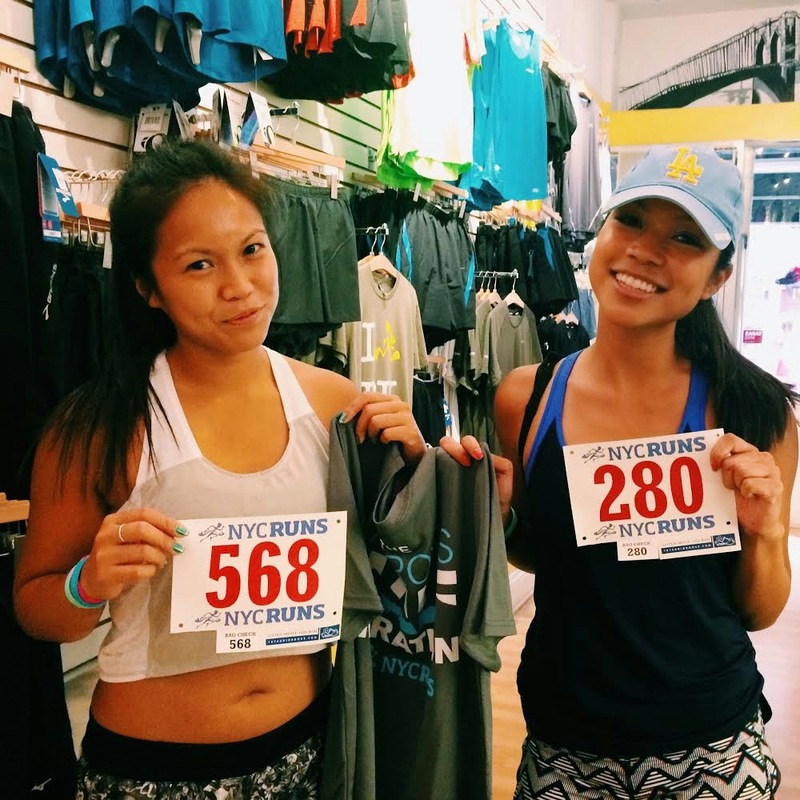 Packet Pickup was at Jack Rabbit Sports - Park Slope (Brooklyn). It was painless, due to this being a smaller community run half marathon. There were only about 400 participants. For $35 you get a bib, a techie shirt, and a finisher medal. Not bad, at all! NYC was going through a heat wave during this weekend. So we decided to test out how our lungs would handle it. And, of course, no race is complete without a race day outfit grid. Clockwise: Nike Women's Miler Tank Top, (underneath the tank) Incredible by Victoria's Secret Sports Bra, Nike Air Zoom Pegasus 31, Lululemon Fly Away Tamer Headband, NYCRUNS bib, Nike Sport Hair Ties, Nike+ FuelBand, Nike+ SportWatch GPS, Lululemon Run: Speed Short *4-way Stretch, Victoria's Secret Sport Stretch Hip Pack. The race starts and ends at Shore Road Park Pier. The standard bag check is included. We chose not to check anything in. But due to the small size of the race, it looked like bag check was very easy. The race started at 7AM on the dot. The course is extremely flat. Absolutely little to no up or downhill. However, despite the easy course, the humidity made it difficult to run. My Southern California lungs are NOT use to 85% humidity! But you get some really gorgeous views of the southern edge of Brooklyn with scenic views of the Verrazano Bridge and the Manhattan Skyline. By the end of the race I was able to wring out the sweat in my headband twice. Daena and I with our finisher medals at our SoHo apartment for the weekend. This wall art on Lafayette was so fitting after finishing a half marathon. Rewarding myself with chicken and rice. I couldn't even wait to get back to our NYC apartment, I was way too hangry. Because every one deserves a drink after a half marathon. Nike Store on 5th Ave.